Luck is a word that comes up often when Barbra Russell describes how she and her husband, as first-time producers, brought “A Tale of Two Cities” to Broadway. The lavish musical, based on Charles Dickens’ 1859 novel, opened Sept. 18, the first show of the new fall season. To raise the $16 million ultimately needed to get the show to New York, Russell, a graduate of the College of St. Elizabeth in Morris Township, and her husband, Ron Sharpe, organized about 35 readings, some at the Hyatt Hotel in Morristown, that involved hundreds of actors. Some of those actors are now part of the Broadway cast, including James Barbour, who plays the leading role of drunken lawyer Sydney Carton; Nick Wyman, as the villainous John Barsad; and Natalie Toro, as Madame Defarge. Russell and Sharpe worked on the show for about eight years with Jill Santoriello, who had been writing the book, music and lyrics off and on since she fell in love with the novel in high school. “We got lucky,” Russell said, adding that they developed a family atmosphere among their investors and others who worked on the show. They also tapped the talents of their backers, most of them New Jerseyans and first-time theater investors, to market the show and their contacts to find more investors. The Avenel native, whose parents named her for singer/actress Barbra Streisand, did not intend to pursue a life in the theater. While attending Colonia High School in Woodbridge, she competed in tennis and tae kwon do. Her sister was considered the singer, though Russell sang in the high school chorus along with the rest of her class. The chorus teacher, Terri Fisco, “gave me the confidence to say this is something I could do,” Russell said, though she only considered singing something to do for fun. Russell went to the College of St. Elizabeth as a history major, expecting to go to law school. As a sophomore, she enrolled in a one-credit singing course but dropped it when she learned it was a private lesson rather than a class. However, she “got up the nerve” to take the course the next semester, and that decision changed her life. Betty Ann Cluthe of Morristown, a voice instructor at the college for 14 years, played a piano scale as Russell sang the notes at the beginning of her first lesson. When her pupil hit a high C, then a high D, Cluthe knew she could sing on Broadway someday. “I thought, Oh my God, this is a natural beautiful voice,” Cluthe said. The teacher does remember nervousness keeping her student hiding in the bathroom until it was her turn to sing in college recitals, where her performance wowed audiences. During her last year in college, Russell won first place among singers in the Florence Boughton Young Artist Competition, sponsored by the MacDowell Club of Mountain Lakes. She also spent some of her college years performing in musicals at County College of Morris and Fairleigh Dickinson University to gain acting experience. When she graduated, Russell went to New York to start auditioning. She did commercials and regional theater for about two years until she was cast as in the young leading role, Cosette, in the national tour of “Les Miserables” at the end of 1992. Russell toured the country for three years in “Les Miz,” and Cluthe remembers her parents, Vincent and Nancy, hiring a bus to take family and friends to see the show when it stopped in Hartford, Conn. Playing opposite her as the young romantic lead Marius was Sharpe, who has been performing in musicals and as a trumpet player since he was a boy in Oglesby, Ill.
As Sharpe told Playbill magazine, one night “she kissed me for real.” Their joint biography says that after being married on stage hundreds of times, they decided to do it for real. They married in 1994 and have a daughter, Samantha, 13, and a son, Logan, 6. They are expecting twins in February. The couple performed in “Les Miz” when it traveled to Singapore. There, they met the country’s leaders, who asked them to be the American producers of two albums recorded with the Shanghai Philharmonic Orchestra of China. Russell and Sharpe eventually opened a recording studio in New Jersey. 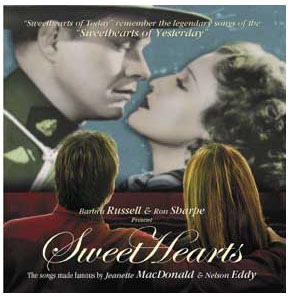 Among their CDs is “SweetHearts,” with songs made famous by Jeanette MacDonald and Nelson Eddy, Hollywood stars in the 1930s. The couple also gives voice lessons and continues to perform in concerts throughout the world, singing at the White House in May. So she volunteered. Sharpe, who was performing in “Les Miz” on Broadway at that time, was more reluctant, but she talked him into it. Russell said the couple and Santoriello became close friends as they helped her shape the story, and Sharpe assisted with the music. They sought advice from people they knew in the theater and attended a workshop on commercial theater producing to see what is involved in putting together a show. “We learned on the job,” she said. After a successful production of “A Tale of Two Cities” at the Asolo Repertory Theatre in Sarasota, Fla., last fall, Russell and Sharpe raised the last of the money they needed, and New York theater owner Jujamcyn Theaters promised to rent them a Broadway theater when one became available. That took eight months. If “A Tale of Two Cities” is a success on Broadway, Russell and Sharpe will go back to raising money for the national tour. Would they take on another Broadway project? “We not thinking of anything right now,” she said. See Jeanette in COLOR “The Vagabond King” in Rome, NY, August 9! Central New York’s Silent and Classic Film Festival returns Aug. 8–10, 2008 at the Capitol Theatre, Rome, NY. Of interest to us is the chance to see two of Jeanette MacDonald’s early films in 35 mm, the way they were originally seen in the theaters! 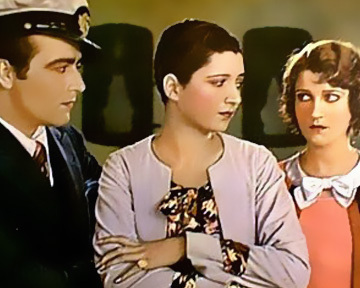 Saturday, August 9th, in the afternoon session at 2:20 pm: Jeanette’s Technicolor film, The Vagabond King! Note: this is apparently the restored print from UCLA. Yes, the film is rather draggy and the acting pretty stage-y, but the songs are wonderful and the color exquisite! Don’t miss this film if you live anywhere in the area! Link for tickets and more details.